The Mexican Mint’s Proof Silver Mexican Libertad coin is the collectible version of the nation’s official silver bullion coins. The Silver Libertad has restricted mintage figures, with its proof coins featuring some of the lowest mintage figures available in an annual-release collection of coins. The 2018 1/20 oz Proof Silver Mexican Libertad Coin is currently available to you for purchase online at Silver.com. 26th issue year for the Silver Libertad coin in 1/20 oz weight! Consists of 1/20 Troy ounce of .999 fine silver. Obverse side of the coins features the official seal of Mexico. Reverse face of the coins includes a depiction of Winged Victory. One of the often overlooked features of the Proof Silver Mexican Libertad coin’s design is the background field of the reverse. The figure of Winged Victory is backed by two volcanic peaks that Aztec cultural lore suggests were named for a pair of lovers with a heartbreaking tale. Popocatepetl and Iztaccihuatl are volcanic mountains 43 miles from Mexico City in opposite directions, but the love story associated with these mountains connects them across distance. Popocatepetl is the second-highest peak in the country and remains an active volcano. Aztec legend suggests it is named for a heroic warrior who was sent to battle by his king to keep him away from the king’s daughter. Iztaccihuatl is a dormant volcano and the third-highest peak in Mexico. Aztec legend dictates this peak is named for the king’s daughter who died of grief when lied to about her lover’s death. 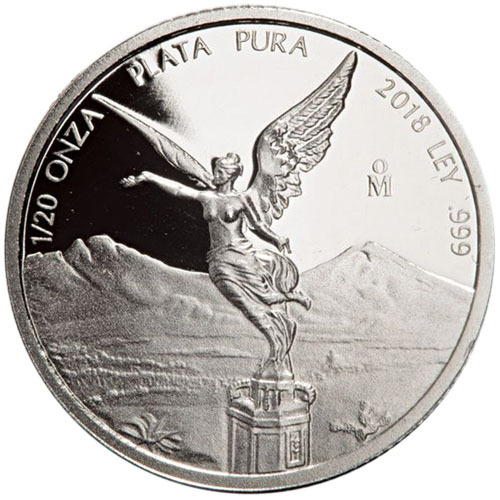 On the reverse of the 2018 1/20 oz Proof Silver Mexican Libertad Coins, the focus of the eye is on Winged Victory in the foreground. Look carefully at the peaks in the background, and you’ll see how Iztaccihuatl, or “white woman,” got its name as the peak looks similar to a woman’s head, chest, knees, and feet while lying down. Engravings on this side of the coin include the year of issue, metal content, purity, weight, and a Mexican Mint mark. 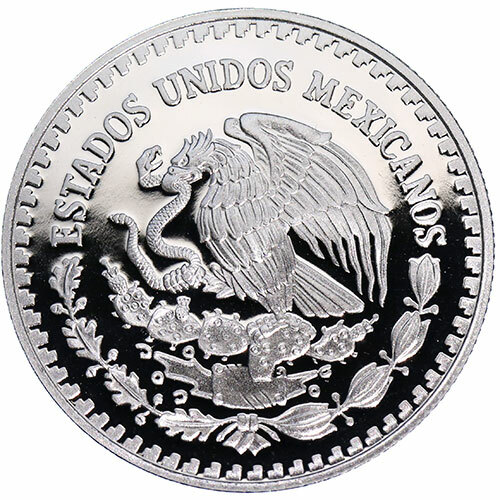 The obverse of all Proof Silver Mexican Libertad fractional-weight coins includes the modern coat of arms for Mexico. This design includes an eagle battling a serpent in the center, with a wreath encircling the bottom of the design and the words “Estados Unidos Mexicanos” above. 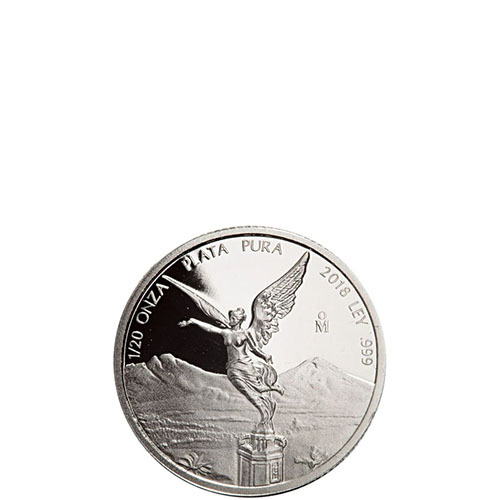 2018 1/20 oz Proof Silver Mexican Libertad Coins are available with a protective capsule. The coins are struck by the Mexican Mint, which is controlled by the federal government and Banco de Mexico. We encourage Silver.com customers to call us at 888-989-7223 with questions. You can also reach out to us online through our live chat and email address.